Sandy Tatum’s famous quote about the 1974 U.S. Open could easily describe this week’s Jones Cup. An extremely penal setup – which some thought was an overwrought response to Johnny Miller’s unprecedented 63 a year earlier – led to a winning score of 7 over par by Hale Irwin, who won the first of his three U.S. Opens. An over-par score at Ocean Forest Golf Club in Sea Island, Georgia, is often enough for a player to add his name to the prestigious list of Jones Cup champions, as well. Only eight players have broken par for 54 holes in 12 playings of the event at Ocean Forest (the 2007 event was played at nearby Frederica). In 2010, Patrick Reed won with a score of 6-over 222, beating future Ryder Cup foe Victor Dubuisson in a playoff. Ocean Forest’s penal layout -- along with coastal Georgia’s harsh winter weather and firm, fast conditions -- make the Jones Cup arguably the toughest test in the amateur game. The Rees Jones and Greg Muirhead design, which opened in 1995, also hosted the 2001 Walker Cup. “You have to stripe it out there,” said 2011 Jones Cup champion John Peterson. “There isn’t a hole out there where you can take a break. Every hole you have to hit it down a bowling alley, and there’s usually trouble on both sides. Peterson is among the recent Jones Cup champions now playing on the PGA TOUR. Seven of the past 10 Jones Cup champions are now playing on the PGA TOUR, while 2015 winner Austin Connelly is playing on the European Tour. 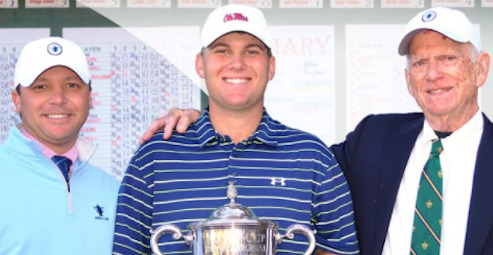 Sean Dale, the 2013 champion, is playing the mini-tours, while defending champion Braden Thornberry is in the midst of his junior season at Mississippi. Thornberry shot 4-under 212 in his five-shot win last year. The roster of Jones Cup champions also includes reigning FedExCup champion Justin Thomas (2012), Reed (2010), two-time TOUR winner Kyle Stanley (2009) and PGA TOUR rookies Beau Hossler and Corey Conners. Jordan Spieth almost added his name to the tournament’s impressive list of past champions, losing a playoff to Peterson in 2011. Spieth three-putted the last hole of regulation, then missed an 11-foot birdie putt on the final hole. “I thought I got past this kind of stage, where if I just needed to two-putt the last hole I could two-putt the last hole,” Spieth, then 17, said. Of course, things worked out just fine for him. He won his first PGA TOUR title little more than two years later. Another strong field has gathered this year, including Thornberry, the world’s third-ranked amateur. He followed his success at Ocean Forest last year with a victory at the NCAA Championship and Sunnehanna Amateur en route to being named AmateurGolf.com’s Amateur of the Year. He also showed that he may not be far from joining his fellow Jones Cup champions on the PGA TOUR, finishing fourth at the FedEx St. Jude Classic and firing a second-round 64 at The RSM Classic before fading to 61st place. Three players who are scheduled to compete in this year’s Masters -- U.S. Amateur champion Doc Redman, British Amateur champion Harry Ellis and U.S. Mid-Amateur winner Matt Parziale – will use the Jones Cup as part of their preparations for Augusta National. Other participants in this year’s Jones Cup, which begins Thursday, are U.S. Amateur quarterfinalist Dawson Armstrong, U.S. Amateur semifinalist Theo Humphrey, Southern Amateur champion Karl Vilips and Players Amateur winner Philip Knowles. Knowles is coming off a fifth-place finish earlier this month at the Australian Master of the Amateurs. This weekend’s forecast calls for traditional Jones Cup weather. The high temperature is barely expected to creep over 60 degrees, but the wind and coastal air often makes it feel cooler. The wind is expected to blow between 10-20 mph all weekend, and there is an 80 percent chance of rain. Ocean Forest sits along the Hampton River and Atlantic Ocean, exposing it to harsh weather. PGA TOUR player Blayne Barber, who finished one shot outside the Reed-Dubuisson playoff, remembers the wind was blowing so hard in the first round that he had to aim right of the creek on the 18th hole because his driver couldn’t cover the 200-yard carry. He hit driver, 3-wood and pitching wedge on the par-4 finishing hole. The next year, Peterson hit 3-iron from 180 yards on the final hole. Winning the Jones Cup isn’t easy, but nothing worth doing ever is.